I helped teach a class on the basics of oscilloscopes to the New Jersey Antique Radio Club. This club is dedicated to the restoration and preservation of antique radios - mainly from the golden age of broadcasting. 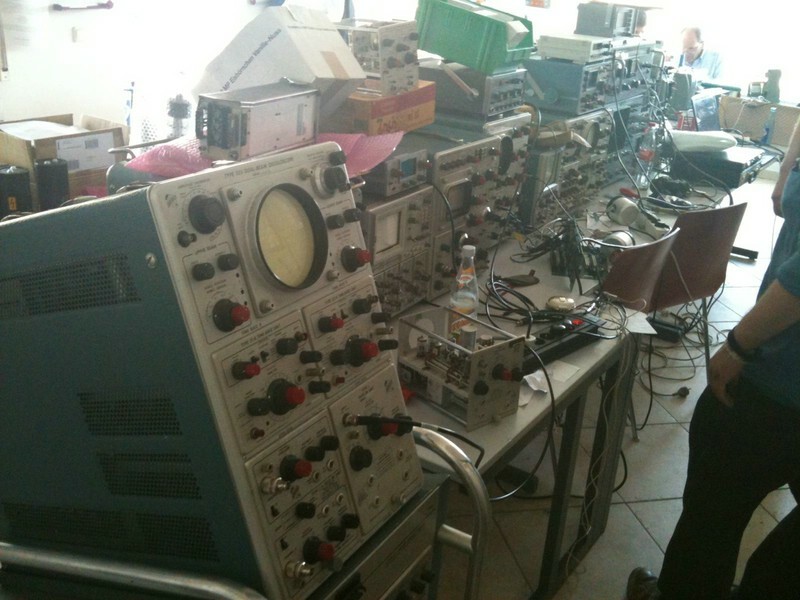 The class was geared entirely around analog scopes, since that's the type of scope that these guys would most likely come across or have access to for their radio restoration projects. We affectionately called the class "Scopes for Dopes", and it was a great success. Fortunately, the session was videotaped. We had two projectors going - one with presentation slides, and one with a video camera feed that was focused on a few scopes on a table for demonstration. To make it easier to navigate this long video - over 2 hours long, here is a list of time-stamps and the topics that begin at those timestamps. Using this "table of contents", you can easily move the youtube player location to the topic of interest. Re: Oscilloscope training class---Watch it!! Unfortunately,I don't have the time to watch all of this right now,--But it is excellent!! I highly recommend that those of you who are unfamiliar with Oscilloscopes & in fact,anyone, watch this. It's not just a quick demonstration of somebody's bench 'scope,but a full on tutorial which you would pay real money to attend if it was held in your home town! Just watching the first section I learned a lot of stuff I was a bit vague on about the history of these wondrous devices! Wonderful tutorial job, including indexing if you want to speed through. I have just watched the whole 2:20 long movie. In addition to the very long oscilloscope training video posted at the head of this link, you might also want to check out a shorter video posted by some of the Tektronix factory guys, talking about the basics of using basic digital oscilloscope. I have been looking for that thing since I first thought I needed a scope. I want to Master the Operation of the Oscilloscope (sounded like a manual, right?). Awesome. Thanks a lot! Thumbs up! Really really cool! I hope you can do more videos. I like your style of teaching. Thank you Armin - I'm glad you enjoyed the video. Which video did you view - the long oscilloscope class, or the 1x/10x probe video? Or, some of the others on my YouTube channel? What other related topics would you like to see videos on? I watched the long oscilloscope class video. I really liked the humor and good energy you brought to the class room. I'd really like to see some classes on transistors and a little about yourself so we know your background. Excellent vids! I'm glad you liked it. My quick background - life-long ham radio operator, worked in a TV repair shop while in school for Engineering (back when people actually did component level debug and repair!). After getting my degree in '85, I spent the first 20+ yrs as a analog design engineer, IC design engineer, application engineer, test engineer in various fields ranging from high speed fiber optics, to disk drive electronics, to RF, and a lot of stuff in between. For the last 5 years I've been a Field Application Engineer for Tektronix. I've already subscribed! That's really great. I'm in school right now and I'm LOVING analog over digital. I'm hoping it'd be possible to do just that, debug on an analog level, but sadly, I feel as though systems have become far too complex in the last 10 years for me to be able to do that. If I haven't already made it clear, I have a huge level of respect for you and others that have done the fantastic work you've been doing for so long. I only hope to become as half a good engineer as most of the people on these boards. Subbed and always looking forward to more of your videos! Armin - if you are interested in analog troubleshooting, I would highly recommend the "Troubleshooting Analog Circuits" book by Robert A. Pease. Bob Pease just recently was killed, a tremendous loss to the Analog Design community. Thankfully, he was a prolific writer, with a regular column (Pease Porridge) in the Electronic Design magazine. That cover is amazing! Look at that jumbled mess of wires! Beautiful! I will definitely check it out! Thanks for the recommendation. FYI - I recently added another video to my YouTube channel that discusses the AC / DC Coupling control on the vertical channels of the scope - and how to get the most out of them. Keep an eye on my channel for other short scope and measurement topics, and let me know if there's something you'd like to see. The following users thanked this post: Gp! Careful,w2aew,you might educate some of the people on this forum,so they can figure things out for themselves. A lot of beginners seem to think of an Oscilloscope as a Multimeter with a picture on the front, rather than the amazingly useful piece of equipment it is. I'd like them to turn off all the additional readouts,& just learn to analyse a displayed waveform,as per your video. If I could have had something like that when I was a beardless youth,just learning how to drive an oscilloscope,I would have "thought all my birthdays had come at once!" Unfortunately,I had to learn in "the School of hard knocks". They do say that experience is the best school,but the fees are very high! Thank you - I'm glad you like them. The ones on my Channel are just shorter topics that address questions that I received after people attended the "Scopes 4 Dopes" class I taught a few months ago to a local Antique Radio Club - or those that viewed the long video of the class (which is the video that is the first entry of this topic). The school of hard knocks usually has the best lessons! You know what they say - Good judgement comes from experience, but experience comes from bad judgement! I've added a number of new videos to my YouTube channel regarding oscilloscope usage. The two most recent additions illustrate how to properly simultaneously capture and visualize two signals that are at dramatically different frequencies. These could be a baseband signal and it's modulated RF carrier for example (hmm, gives me another idea for a video...). Just last night I was trying to find information about 1x vs 10x probes, ac vs dc coupling, and triggering. I found your channel and it was exactly what I was looking for! Great videos with great explanations! Thanks! Do I understand it correctly that this is what Agilent's MegaZoom technology is for? I remember Megazoom as a memory management technology from Agilent's digital scopes from about a decade ago, like the 54600 series - to make it easy to navigate through deep record memory. Of course, back then, 1Mpoints was considered deep memory. Are they still using this Megazoom terminology today? I'm glad you found the videos useful! It's a good thing I did three videos specifically on those topics!! Of course, please let me know if there are other similar topics that you'd like to see in the future. Yes, they are. I was really confused by your video. I couldn't figure out why your scope didn't always use all its acquisition memory. After some searching, I think this is because my scope has the MegaZoom feature. If I understand it correctly, MegaZoom allows them to always fill memory at max possible sample rate without affecting update rates. Thus, MegaZoom equipped scopes don't have a record length selection. Ok, very good, I didn't know that about the MegaZoom. I assume that this means that you'd be able to make an accurate measurement (like a frequency measurement) on these two signals simultaneously, even though their frequencies differ by 10,000. I know that some of the older scopes made the measurements on the displayed points, and not on the complete max-sample rate points, which would result in errors in the frequency measurement for the higher frequency signals when time/div was adjusted for the lower frequency signal. Has this been addressed in the newer incarnations of MegaZoom? What scope do you have? I know that some of the older scopes made the measurements on the displayed points, and not on the complete max-sample rate points, which would result in errors in the frequency measurement for the higher frequency signals when time/div was adjusted for the lower frequency signal. Has this been addressed in the newer incarnations of MegaZoom? What scope do you have? That's still the same on my DSOX3000 scope. You zoom in on the higher frequency signal to make the measurements. Oh, OK. I guess that's part of why the scope feels fast, because it's making its measurements on the decimated data points rather than the full set of samples. Does it give you any indication that the displayed result may be inaccurate due to the sample decimation? I've got a Tektronix 2225 for cheap some time ago. But I've never learned how to use it quite well. I decided to fully go over it along this week and finally fully learn how to get the most of it. I've made some searches and found Dave's #196 video. That was a great start. He fully describes the 2225! Never heard of the EEV blog before, watched a couple of dozens of his videos and went very curious about the forum. Just joined a few minutes ago (my very first post here) and just found this. Amazing! it's been a very fruitful week! Thanks so much, guys. You both made my day! Congrats on the 2225! Be sure to ask if you have any questions. If the loooooong "Scopes for Dopes" class video doesn't answer your questions, or any of the dozen or more videos on my youtube channel http://www.youtube.com/w2aew don't help, be sure to ask - we'll be happy to help you out. People always keep asking me for a "simple" and "short" beginner oscilloscope tutorial, it's just not possible, there is just so much stuff to cover. I'm surprised you got it all into in a 2 hour presentation! Thanks Dave. Of course, this only covers the basics of the old school analog scopes. Lots more to cover on these (advanced triggering, delaying timebases, etc. ), so I've tried to cover those with some of my other vids. Then there's a whole host of additional topics when you get into digitizing scopes, with issues such as sample rate, aliasing, memory length, automatic measurements, etc. It hit me one day when speaking with a younger colleague about a scope, and I said something like "...now change the sweep speed...", and he stopped me and said, "What's a sweep speed?" All he had ever seen was a Horizontal Scale control on a digital scope. Sad. I hate to see the genius and power of the analog scopes fade away. Account is inactive now. Thanks everybody! I'm sorry about the audio quality. Unfortunately, the decision to record the class was a "last minute" decision, and thus the right equipment and setup wasn't available. Originally, I was just going to teach the class to the group in attendance only. I'm glad that it was recorded, but you are right, the audio isn't great. I posted another video (by request). This on describes the function and use of some of the Vertical controls on an analog scope - specifically the ALT, CHOP, ADD and INVERT functions. I believe that if an independent like yourself did a short video on choosing a `scope for automotive (engine analysis) work it would be both popular and very useful. All the ones I have found save a few by ScannerDanner on YouTube, have been by people trying to sell you their product, and I have found them couched in tech speak that hides the products weaknesses whilst extolling their (fantastic) strengths Memeory depth and the ability to run a slow timebase seem essentials, but how would an analogue `scope fare, is it essential to go digital? One maker of specialist USB `scopes for automotive use says their floating inputs are essential, another very popular maker poo poos this and says it's not necessary, then a month later, on their own forum, goes into a diatribe of the risks of injudicious probing. I've added a number of new videos to my YouTube channel regarding oscilloscope usage. The two most recent additions illustrate how to properly simultaneously capture and visualize two signals that are at dramatically different frequencies. Thanks for doing these series of tutorial videos. I have always struggled with the delayed timebase feature on my analog scopes. I followed along in your tutorial with both a 2252 and 2232 (in analog mode), and learned that my most basic mistake was incorrectly triggering on the B sweep. However, I found that the B trace was almost invisible at 50ns, even with max brightness/contrast. At first I thought it was because of the age of my scopes and the possibility that the CRT was not as bright as it could be, but in reality, they are extremely bright. Is it normal for the B sweep to be so low in contrast well within the bandwidth of the scope? Are there certain analog scopes that are better than others for displaying delayed timebase? The low brightness of the B sweep is most likely normal - it depends a lot on the difference between the sweep speeds of the A and B sweeps. The larger the difference, the dimmer the B sweep will be. Some scopes (like the 485) had a separate intensity control to help brighten up the B sweep when using high levels of "zoom" in the sweep speeds between A and B. A few "special" models of scopes, like the 2467, included a very special CRT - something called a Micro-channel Plate CRT. This CRT had an electron multiplier immediately behind the CRT's face which dramatically improved the writing rate - and thus the brightness of these very fast sweeps. I show this scope in a few of the videos, like the one that shows the characterization of the RF Power Detector. For most scopes - yours included that do not have have these special features, the intensity of the B sweep can be improved by using a smaller ratio of A:B sweep speeds when possible. Or simply change the Horizontal Mode from ALT (alternating between A and B) to using just B only. In other words, use ALT-A/B to properly set the delay and B sweep speed. Then, once they're set, change the horizontal mode to B-only to just show the B sweep. I think I can guess the answer, but why have most CRT type analogue and digital scopes historically had relatively tiny screens compared to say a TV? Is it something to do with cost of tube manufacture that is either accurate enough, or trace refresh fast enough, in large sizes that is / was the limiting factor? I know some of the automotive engine analysers from the likes of Sun had TV sized screens, but i guess they are being used at low refresh rates? Where there any relatively fast scopes ever made with large screen sizes? Just curious. I am also curious as to why analogue scopes have vast amounts of set up "adjusters" inside them for calibration purposes, yet even a high end USB scope has virtually nothing obviously adjustable within them. Great video re triggering again, the last one on auto triggering. I thank you for these. Chris - as you guessed, it all comes down to speed. TV screens are scanned at much slower rates than even a modest analog scope. The lower scan rates allow for magnetic deflection (coils on the outside of the neck of the tube), which would generally be incompatible with fast deflection speeds. CRTs in analog scopes used electrostatic deflection (deflection plates inside neck of the tube), which lend themselves to much faster drive frequencies. As for calibration adjustments in the analog scopes... There are a lot of variables that enter into the accuracy of the analog scopes, mainly due to the multitude of circuitry between the front panel connector and the deflection plates (attenuators, preamps, amplifiers, offset control circuits, drivers, final amps for the plates, etc. - and that's just a portion of the vertical analog path). Each of the analog circuits will have offsets, non-linearities, etc. that need to be zero'd out to calibrate the response). Similar adjustments would be need for the horizontal and trigger circuits. By contrast, the digital scopes are much simpler. 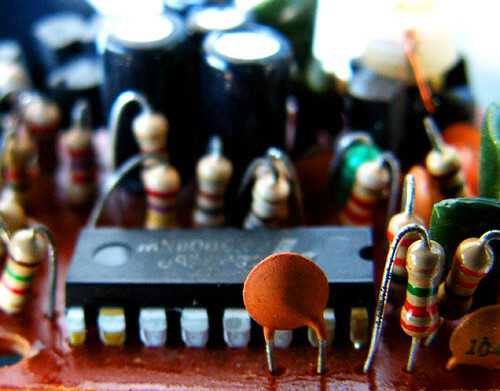 There is some analog conditioning circuitry between the front panel connection and the ADC (analog to digital converter). Once the signal is sampled by the ADC, any calibrations adjustments to the signal can be applied digitally before being displayed. Thus, ALL of the complexity of amplifying the signal to drive the deflection plates of the scope is gone. Basically all of the calibrations and corrections are applied to the sampled data numerically after the data is sampled using calibration data installed at the factory. I think that the analog CRT could be bigger with an electrostatic deflection without any sacrifice of a speed, but deflection angle of an electrostatic deflection system is usually small. Correction of non-linearities resulting from larger angle becomes more difficult considering faster sweeps. That means if the scope screen would be bigger (keeping the deflection angle constant), then the CRT neck would become impractically long (it is already very long even with "small" scope screens). Scale that length in proportion of your desired screen size and think whether or not you would want it to your bench. TV CRT's used 90 or 110° deflection angle, thus it makes shorter tube necks possible. Thanks for another detailed and helpful reply, I have to say one of the nice things about my USB scope is I can be working on a vehicle and have the 17 inch laptop display show the traces, or even a 24 inch monitor or one could use a projected image. It's a big time saver being able to watch traces without coming out of the footwell, or walking upp to a tiny screen. Somewhere I read a story about Tektronix. Sometime in the late 80's they were designing transient digitizers that used a scan converter tube. They made digitizers that could capture 4 GHz transients. The russians then invited the guys from Tek to show them their transient digitizer. While the Tek digitizer fit into a 19'' rack the russian version had a scan converter tube that was 10 feet long and worked well into the 20 GHz range. The voltage swing was also limited by the output transistors avaliable at that time. You may be able to do something about the plate geometry to increase deflection, but I'm not sure if this can be done without any reduction in bandwidth. There's definitely a correlation between deflection angle and bandwidth. For example the 1 GHz Tektronix 519 (ca. 1959 or so, the input directly drove the vertical plates, without any amplifications/attenuation) had a very small CRT surface, only 4x2 divs or so. The low-bandwith Tektronix 5000 series, designed for biomedical experiments, had a very large CRT. Bandwidth was ultimately limited by the depth of a standard 19" rack as used by the US army (how many people do atomic bomb tests in their backyard?). I believe the USSR had a scope with a larger bandwidth, which just used an extremely long CRT. No idea if this idea ever made it into production. Thanks for the excellent videos. They have been very educational, easy to follow & understand. Excellent work that is very much appreciated. A few questions about the coax video. Would other faults show up? eg, a hole in the shield but not a complete break? A compressed shield but not touching the center conductor and creating a short, yet? Also, is it possible to calculate the distance to a short? Sorry for all the questions. All your videos have been great but the coax one is a subject that I am specifically interested in! Again, thanks for the great work. - a hole in the shield without a complete break, or a compressed shield may or may not show up. It all depends on how much of an impedance discontinuity it creates. Impedance discontinuities cause reflections, just like the mis-termination of the end of the line (like the open circuit example I used, or the shorted example I showed). The worse the impedance discontinuity of the defect, the easier it will be to detect. Once observed, you can measure the round-trip delay and calculate the approximate position of the defect. - Yes, you can determine the distance to a short (only the first short!). You can see this at the end of the video where I dialed the pot down to zero. You can measure the width of the pulse that's shown, and that will be the roundtrip delay from the scope to the short and back. Calculate the distance the same way as I did for the open. Thanks for the response!. Somehow I figured there would be an "it depends" in there, such is life! It does sound promising though. Some of the stuff is easy to find. Shields like to break near connectors, or if the cable passes through trees I can pretty much bet good money a squirrel has gotten my coax mixed up with his acorns. Never knew aluminum was so tasty. The worst for me inevitably turns out to be a couple shotgun pellets shorting out the cable. Not exactly the easiest thing to find and they NEVER radiate when you're looking for them! What would be the maximin rise time that would be preferred in a function generator for this? Ideally, you'd want the risetime to be a few times faster than the propagation delay through the cable of interest, so that you get a clean "plateau" between the incident edge and the reflected edge. For typical coax with a 0.66 velocity factor, the speed of a signal is 7.79 inches per nanosecond. Thus, a 10ns rising edge of the pulse will be spread out over about 6.5 feet of cable (i.e. the voltage 6.5 feet from the generator is just starting to move at the same time that the rising edge has finished moving at the generator). If the pulse's risetime is slower than the roundtrip delay, then the reflection will be seen during the edge, making it much harder to accurately measure the delay. For basic coaxial work like was shown in the video - for 10, 20, 30 feet or more of cable, a 10ns risetime is good enough. You might check the risetime of calibrator signal on your scope - it might be fast enough to use for this application. I remember using a TU-5 Pulser for this purpose,which used a tunnel diode. In use,you connected it to the 100 volt calibrator on a 545B or similar,& the TU-5 produced a very much lower level,(but very much faster rise time) pulse which was excellent for checking the 'scope,& for TDR purposes. I had one hanging around for years,but I don't have a 545B,or anything similar,so no high voltage calibrator. I thought of making a vacuum tube multivibrator to produce a 100volt square wave,but "put it in the too hard basket". Eventually,I gave it to a friend who collected 545s. Great tutorial video as always W2aew, thank you Sir ! This video inspires me to learn & tinker with this poor man TDR thingy, and since you did mention high speed rise signal as a reference in that video, I assume I can also use my vintage Tek 2901 time mark generator that generates those really sharp spikes for this purpose too right ? Example of the time mark signals generated by that 2901 at various speed at my Tek 2465B. Thanks again! Normally if the problem is in the 1st 30' or so I'll find it by other means, usually when I'm not really looking! It's those few hundred feet that follow that can be a royal pain. Thanks for the tip about the Cal signal as well. A function gen was the next thing that I wanted to get anyway, but the Cal signal should give me a bit of a starting point to help determine what I should get. Again, much appreciated! While I can't find it at the moment, I remember one of Jim Williams Application Notes on building a ~400ps pulse generator for testing oscilloscopes and probes. IIRC is was AN47, but doesn't appear to be on the Linear web site anymore. I'm dumb as a stump compared to most of you real engineers, but still got a kick out of reading his stuff, much like Alan's recent tutorials. If I go to linear.com and search for AN47, the first link is a PDF of the correct appnote. The later circuit with a charge line, as described in LT AN79, 94 and 122, might be better, since it generates something approaching a step, as opposed to a semi-Dirac pulse. Yeah, my bad, I just went to this link and saw it missing in the first section. Those time mark generators are cool. Wish I had one myself! You can give one of them a try. Since it isn't putting out a pulse, but rather an "impulse", you can measure the delay between the peak of the incident impulse to the reflected impulse (which might appear on the trailing edge of the incident impulse). Just be sure to make the repetition interval of your marks much longer than the expected round trip delay so that you don't mix up a reflected impulse for a repeated incident one. Wow - impressive photos! You'll have to tell me how you get such nice photos of analog scope screens like that! No reflections of the camera, etc. Nice. Are you using some sort of a hood like the old polaroid style scope cameras? Now, go grab some coax and let's see what those TDR reflections look like! Here's a little test with some cheap thin CCTV coax, probably 75?, both with open end, and 50? termination. That looks like a long length of coax! Not nit picking here, just trying to be sure I understand the principle. In the above examples, using the really fast & small pulses. The first pulse is transmitted from the generator, and the second pulse is the reflection? So at 240ns between pulses the length would be about 80 feet? Aw heck! I wrote down the 400ns in the above post from notes on another piece of Coax. You're absolutely right, the return pulse is coming at 240ns. I was just going by the markers on the scope which look to be reasonably well placed. I think your error was the 7.79ns/foot. Its more like 7.79"/ns. Another question, not that I haven't already veered this far enough off topic from oscilloscopes to function generators, sorry. Would it be possible to use the TTL signal for short distances and switch to the normal square wave type signal for longer distances? I really like the older equipment (both for budget as well as nostalgia) but looking up the specs for the older models isn't the fastest thing in the world. Better than it used to be though! Anyway, it seems pretty common to find TTL rise times of <50ns but the square wave rise times seem to hover around the 100ns range. So I thought the TTL signal would be decent for short distances and the normal square wave would work fine once cable length exceeded rise time delay. Or am I completely off base? Oops - not quite! For coax with a velocity factor of 0.66, the speed is 7.79 INCHES per nanosecond! (7.79ns/ft would be faster than the speed of light!). Whatever gives you a fast enough risetime to discern the difference between the incident edge and the reflected edge would work. It all depends on the typical lengths/distances that you need to measure. 10ns edges work pretty well for lengths greater than several feet. for a 50ns edge, you'd probably have trouble measuring distances less than 30-40 feet or so. I will post my results on this poor man TDR once I did it, its just I don't have any long coax with me right now, most are only 1 to 2 meters max. About those scope screen photos, thanks, actually its quite easy and no fancy hood at all. I was using an entry level dslr with just stock lense, the secret is I used a camera remote that made it so easy to shoot in the dark, hence no reflections at all. Also the handy part of using remote is, once the scope is ready with the camera placed and set properly like the focus & framing and etc, then all I need is just switch off my bench table light for few seconds while I pushed the remote in my other hand, and then turned the light on again. About the reflection, usually I turned off any background light when I'm going to shoot scope's screen, and with only my bench table light which was the only light source in the room. Actually even using a P&S camera is possible too, as long it has a self timer, but using remote is far more convenient, no need to rush in the dark accidentally bumping or knocking out things around. Now, the other part is altering the photos, for scope's screen shot, I altered it using program to make it better since this is just a scope's screen. And the procedures that I used are not complicated and pretty fast I'd say. Example of the original photo straight from the camera, only cropping and resizing applied, nothing else. Using the popular freeware PAINT.NET, you can get it here -> HERE or other graphic editor like Photoshop if you have it, adjust the brightness level & contrast using the simple level menu. This is the default setting when we opened this Levels Adjusment sub menu. Just a few adjustments on the those levers, after few trials, you will get used it easily. The result with just those few drags, no fuss nor complicated tasks, then save it, that's it. Nice - thanks for the tips. I'd have to run across the room to hit a lightswitch! I've posted a few videos in the recent weeks, the most recent was today where I discuss some of the auxiliary input/output connections on the rear panel of many old analog scopes. Enjoy! I added another video over the weekend, showing how to use a pair of 555s and a pair of NPN transistors to create a "marker" on the trace(s) of an old analog scope by applying a sweep-synchronous, delay-adjustable pulse to the Z-axis input. Alan, thanks for this excellent tutorial, I've been looking for a good practical example using that extra Z axis input, yours is the best imo. Did a quick circuit capture from that video to complete that video, hope you don't mind. Yes, he is correct. Any diode, germanium or not, is a non-linear device, and will generate harmonic distortion products as well as intermod products. While these diodes are not "in" the RF path, they are tapped onto it. Thus, there will be a small amount of harmonic components injected back into the RF line - both through the coupling cap as well as from simple stray pickup through the air. The latter can be reduced by shielding the detector circuit from the main RF thru-path. Lowering the load impedance seen by the detector will also help. In my tests, these distortion products were 45-50dB down or more from the main signal. So, technically, he is correct, and you should be careful regarding this. You can check it yourself by listening for your third harmonic (3x your operating frequency), which will typically be the largest product generated. Maybe have a buddy listen to your main signal, then listen for you at 3x that frequency. It is likely that you will not be heard at 3x. However, it is definitely worth checking out to be sure that you are being compliant with spurious emission levels. The simple resistive divider used to monitor the RF envelope (the most useful thing anyway) will not introduce any distortion effects at all. Note also that the demodulator circuit is typically used for linearity measurements of an amplifier. Thus, the demodulator would be connected to the RF before the amp, and the resistive monitor connected after the amp. The only reason that I have both of these circuits connected to the same RF line was to demonstrate the function of each circuit - they'd never be used simultaneously in this way. Alan these videos are wonderful, thanks for doing them. Learning a bunch! I'm very glad that you are enjoying them. There are plenty more on my Channel that I haven't posted here. And, I'm always up for suggestions for new video topics that you'd like to see. I'm just trying to live up to the quality of Dave's videos! Thank you for this, it is really impressed and I will finish watching. So exciting and helpful.Compare to the book knowledge , these videos give me something more. I'm glad you enjoyed the video(s). Please let me know if there are other topics that you'd like to see. I would like to see your take on compensating the scope probes that have both the low and high frequency compensation trimmers. And if you would explain why some probes have both and some only have the low frequency compensation. I have Agilent N2863B probes. There is a trimmer in the tip which is adjusted using the familiar 1KHz square wave output from the front of the scope. There are 2 more trim adjustments for the high frequency at the base of the probe where the BNC connects to the scope. It appears that a fast rise time step is used to make the adjustment. Thumbs up! !I really like them,but dont got enough time to watch all,could u recommend some? Let me know what topics you want to learn about, and I'll recommend any of mine that might be of help. I loved the main video and entire cycle of materials showed by w2aew. For me this is kind of "back to school" and school lab. Which reminds me, in our oscilloscope classes we had sort of practical exam on how to make oscilloscope draw a line, two lines, dot, two dots - all using function gen and xy mode. This may be a good idea for another video, or on checking if people in class understand the basics. I would like to see some info about using oscilloscope with high voltages (like 1-2kV) in inverters or power sources in analog oscilloscopes or analog tv. I too would like to see details on the safe viewing of high voltage DC power supply ripple. I am building a couple of supplies for big RF generators, one 3kV and one 5kV I also want to view the AC output of the transformers when they are under load. Thanks, it's a great resource Alan. I added a few more videos over the last several weeks. The most recent is a basic tutorial on how to use the FFT function in a digital oscilloscope. I posted another video in the "scope basics" series tonight - this one talks about oscilloscope probe ground lead length, and it's affect on measured signal integrity. I have a question about my Hantek 200MHz. Why is the square wave Rise Time change when the FG frequency change? For example; 10us@100Hz, 1us@1KHz, 200ns@10KHz, 80ns@100KHz, 76ns@1MHz. Making the assumption that you are changing your horizontal time scale (sweep speed) at the same time that you are changing the FG frequency, I would say that the change in rise time is not real. It is due to the fact that the at the slower horizontal time scale setting, the effective sample rate is decimated (lowered), reaching a point where very few if any samples actually land on the rising edge at all. The scope interpolates between the waveform points. At the lower effective sample rate, the interpolated waveform between these widely spaced points does not accurately reflect the true rise time. To test this hypothesis on your scope, setup the 100k or 1MHz square wave and make the rise time measurement. Without changing the horizontal controls, simply change the square wave frequency on the FG down to 100Hz. You should still have a rising edge on the screen, and it should still be reading the same fast rise time. This is the true rise time. If the rise time slows as you move the horizontal timescale to a slower setting, then the scope is lying to you at these lower speeds due to the sample rate decimation. This is a fairly common problem, that measurements are made on only the displayed point or on severely decimated samples. Some scopes give you the ability to control the sample rate and memory independent of the horizontal sweep settings so that this type of distortion due to under sampling can be avoided. However, if the experiment above (changing FG frequency, leaving scope horizontal alone) results in slower rise time at slower FG frequencies, then it has nothing to do with the scope and is a property of the FG. "To test this hypothesis on your scope, setup the 100k or 1MHz square wave and make the rise time measurement. Without changing the horizontal controls, simply change the square wave frequency on the FG down to 100Hz. You should still have a rising edge on the screen, and it should still be reading the same fast rise time. This is the true rise time. " Exactly! Same rising edge & same rise time. As usual, thank you very much for your detailed explanation. It is very unfortunate that your scope LIES to you at the lower sweep speeds. Better digital scopes will at LEAST tell you that they have "low resolution" or "insufficient sample rate" for a given measurement in these types of cases. It's good that you now know about this characteristic of your scope. and even with chinese firmware on it, knowing TEK, i can completly blind navigate through almost all menus. And gues what this DSO can, yes, it shows (a chinsese character) when measured values can not be properly calculated. I have no idea why the "current" model, which was however designed already 3.5yrs ago, is not having such simple functionality. Maybe simply lazy developer. I did reversed (partialy) their firmware and i know that they at least analyzing waveform risetime before they applying filters - so the data "valid, not valid, value" is there somewhere. But this is exactly the "small" difference between some old known manufacturers and the rest of the world. Or maybe simple question of price (diff between Hantek and Tek is already >500USD) ? Maybe both, but this is what all the beginners out there should realize before they buy anything. You have done such a great job on all of your Oscilloscope tutorials, it's amazing how certain things can be explained on completely another level by the right person. This is excellent! I have been looking for videos like these for a long time. Thank you soo much, regardless of the sound! Yep I have to agree. Some of the clearest and concise tut's on O'scopes and circuit theory around. I have subscribed the the Youtube channel for some time. Awesome! Really really cool!I like your style of teaching. I am learning more about Oscilloscope as we are more interested in this market. I recently added a video that discusses the waveform sampling process in typical digital oscilloscopes. Great! that was very useful! Thanks! Really nice ! Thanks for sharing ! Really great material, thanks for the pointers! Great tutorials. I used them back in highschool, but its been over 20 years or so ago. I'm just relearning again as a hobby. This is fun stuff. Thanks! Which one? There are over 100 on my channel now, most of them are tutorials of some sort. IMO all of them! Yet to see a boring or bad one Appreciated, great YouTube channel! Thank you for this. I've been out of the electronics field for quite some time and am getting back into it. As life goes, if you don't use it, you lose it! So I'm a bit rusty and this is a great start. Thanks again! Great tool, thanks for posting! Watching this has been on my 'to-do' list. Finally put in the time today to watch the whole thing. Very informative and enjoyable. Thanks so much for posting the video! I'm glad you enjoyed it. I have many more (shorter) videos on my channel, dealing with everything from various scope and Test & Measurement topics, circuit tutorials, troubleshooting vids, and ham radio topics. In any event, the one I linked is updated, maybe for better or for worse, some material seems to be gone but other material was added. Sorry to the rest for getting temporary OT. Not sure what you are doing when inserting urls, you just need to type it and the forum will convert it to the right thing. And the forum software will format it right for you. Edit: Works! why is there a "link" button - 2nd from right 2nd row - looks like a page over the globe ?? This topics has been covered in a few different videos, but is requested so often by my channel subscribers that I put a dedicated video together. It reviews and demonstrates why properly compensating your 10x probes to *your* scope is so important, and why a probe with a much higher BW than your scope might not be suitable (and can lead to a poorer frequency response than a lower BW probe). Rather than generic o-scope tutorials (which have their place), where can I find a good Noob tutorial on the DS1054Z scope specifically? You know, something which covers all about it, but from a noob perspective. Is there such a thing? Regardless, I *am* grateful to those who posted the more generic videos, as at the moment that may be all there is. I second this. In some of Dave's videos I cannot see his right hand (the controls). Since this scope is so popular seems like a good Noob tutorial on the DS1054Z would be a hit. I would like to see one that covers all the features. So lets cross our fingers. Thank you so much for all your videos which are extremely informative. Your choices of what things to cover are really good. Thank you! Usually the best suggestions for topics come from viewers like you. I recently delivered a presentation to the NJ Antique Radio Club that reviewed how to use an analog oscilloscope, and then showed how to use the scope to view the signals inside a classic "all american five" type of tube/valve AM radio. Please note that the audio is not perfect - there is a "demonstrator" radio playing in the background, but it isn't too obtrusive. The first 50 minutes is the "short version" of the class that led off this thread, and the last 30 minutes is looking at signals inside the demonstrator radio. I tried to apply your video on 2 different frequency signal measurement on a DSO but "failed". I'm using a Rigol SDG-2042x to create the 15Mhz and 1.5Khz signal to a Rigol DS1054Z. Whatever acquisition I choose from it's either displaying the correct frequency of the lower one or the higher one when adjusting time-base of course. Can it be that this Rigol just calculates the frequency based upon the screen result and not the memory? It certainly sounds like the sample rate of the waveform data isn't sufficient for both input frequencies simultaneously. This is either because the measurements are made on the displayed points and not the acquired points, or that the acquired points don't have sufficient sample rate at the slow timescale settings. I don't know if the memory/acquisition settings in the Rigol give you the ability to change this or not, I've never used one before. Aha.... I found there is a Frequency Counter, not a soft-menu item from the whole selection, which you can switch on and then reveals the frequency on the top-left hand corner. This is then Spot-On!!! WOW! Over 100,000 views of this thread! I hope that it has helped folks to learn more about how to use an oscilloscope. Kudos. You make great teaching videos. Straight to the point, short, and snappy. Thanks for the great video's heliping me to brush up on my very rusty "scopemanship"
Deep memory mainly becomes an issue when you need long term captures of high frequency signals, where you need both long waveform times and high sample rate. How often do you need that? Depends on what you do. The scope on my bench has 20M record length. Most of the time I have it set to 10k record length. Occasionally I'll dial it up to 100k or 1M, but this is rare. As for bus decode and triggering, this depends on what you're working with, and if you need to see the decode on your scope or have a need to trigger on a specific command. Note that there are inexpensive digital logic analyzers that can do decode on these various busses too. The good news is that the luxuries of deep memory and bus decode/triggering are available in scopes and instruments that won't completely break the bank anymore. Returning to electronics after a 25 year break.